It's Father's Day today here in Australia, and in honour of all things DAD, today I am sharing the card I made for my Dad and Father-in-Law. I was inspired by this card, made by fellow demo, Libby Dyson. I've used the new Jute Twine on this project (you can find it on page 13 of the Holiday Catalogue). It's perfect for masculine projects. I've used tons of it already! 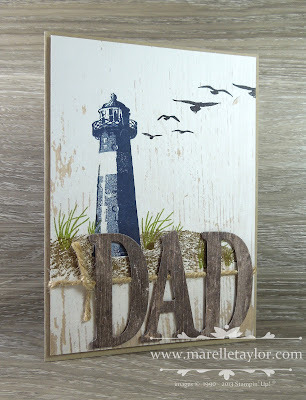 I love the lighthouse image in the High Tide stamp set, and it's such fun making the scene come to life with the other elements in the set. I've also used one of my favourite products, the Wood Textures Designer Series Paper, for both the whitewashed background and also the letters. Speaking of the letters, they were a recent splurge. They've been on my wishlist for ages, and I finally succumbed! I know I'm going to get a LOT of use out of them, for many years to come.....that's my story, and I'm sticking to it!